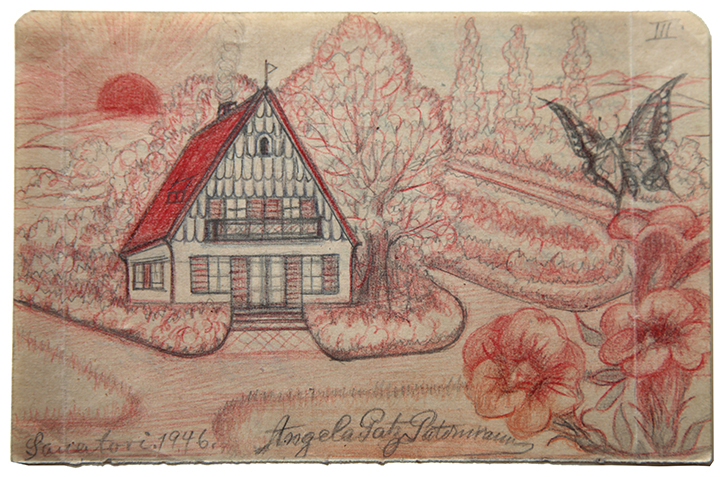 "The drawings of Angelika, a guest in the exclusive Sanatorium Dr Sinn in Potsdam, are pure Art Brut. They are sensitive, exquisite treasures from a timeless realm characterised by invention, memory and quiet contemplation. 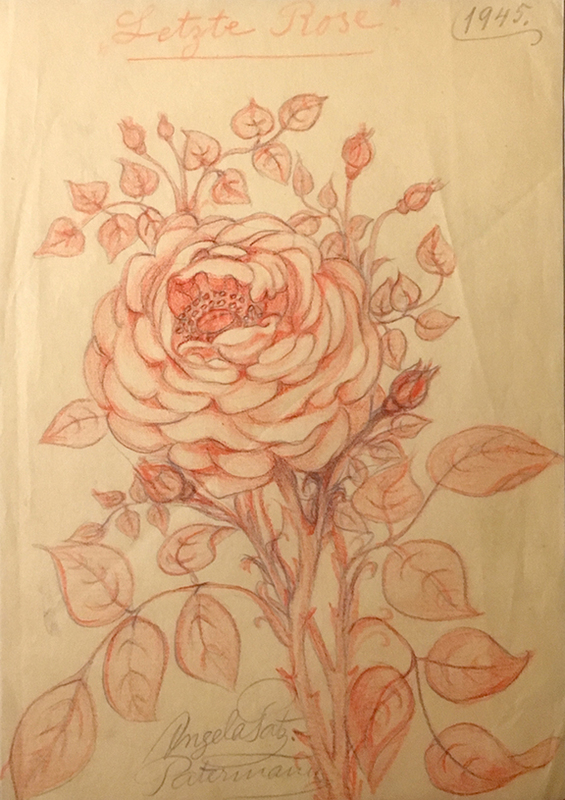 Rendered in the gentlest pencil lines, these drawings nevertheless have a power that insinuates first into your eyes and then into your soul. These are organic works. The sun is always rising. Buildings – even sanatoria – are always homes. Nature is always present and tumescent. In fact, there is something of that same visionary sensibility we see in the great, early work of Samuel Palmer or, perhaps P. O. Runge. An earnest desire to communicate; to be clear about her message and intentions lead Angelika to provide text. 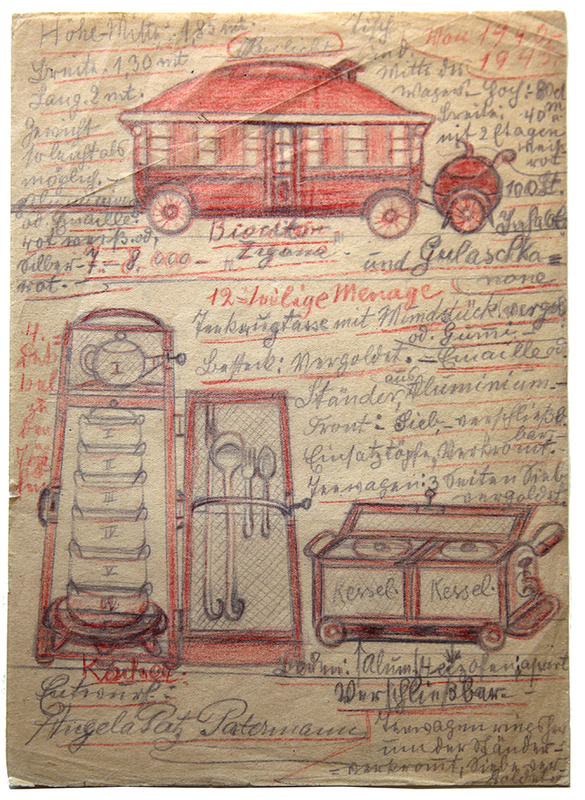 Labels, lists, explanations and poems characteristically accompany her images, often functioning visually as part of the packed picture space. In spite of the external horrors of the times and place in which they were made, these are not so much images of hope as one’s of otherworldliness. 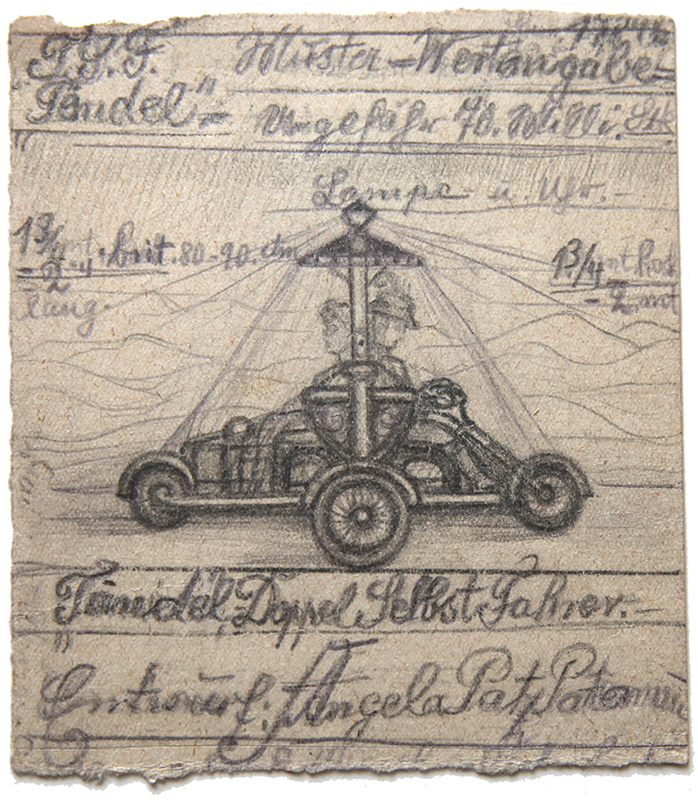 It is as though Angelika had travelled to another place to participate in and bring back images from another way of life." 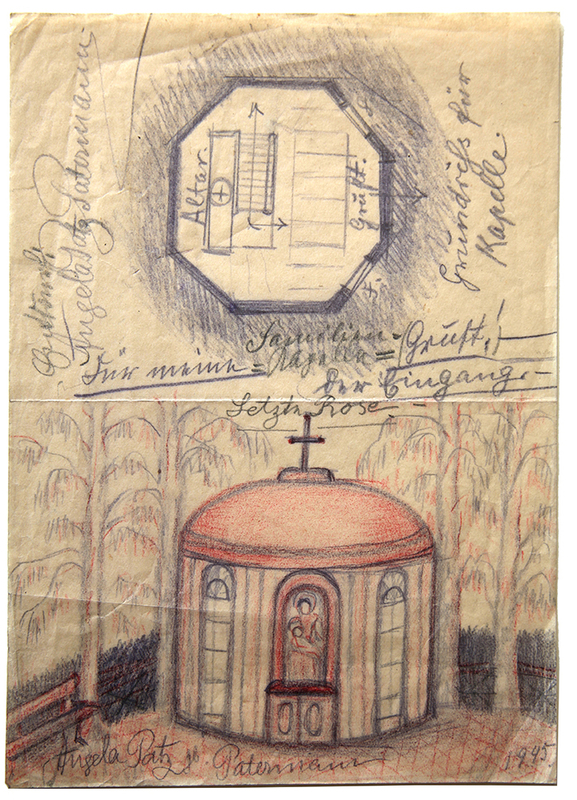 Little is known about the mediumistic artist “Angelika”, this pseudonym possibly deriving from the Russian name meaning 'Messenger', apart from the fact that she was a psychiatric patient in the Sanatorium of Dr Sinn in Babelsburg, Potsdam, and later that her work was included in an important Berlin show of Art Brut, where Chaissac, Schroder-Sonnenstern, Scottie Wilson, Theo, and a number of Gugging artists were also displayed. 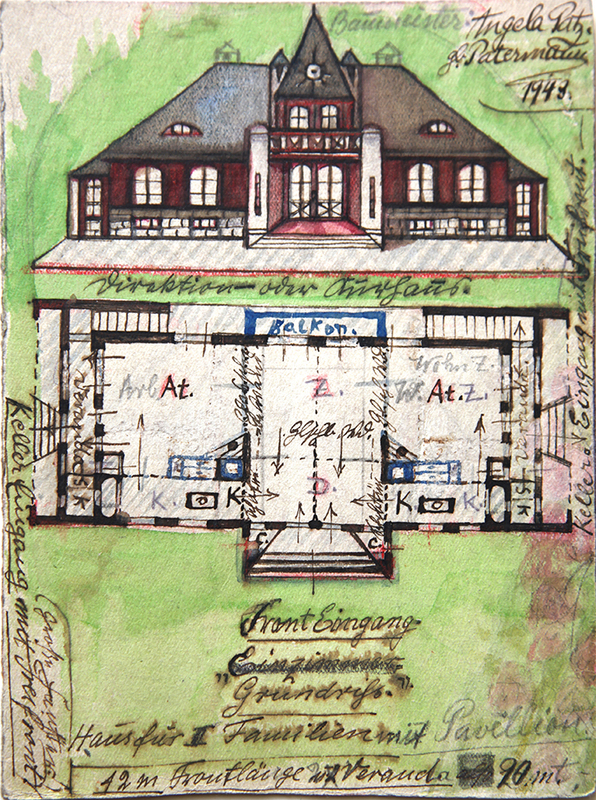 How the work was saved, kept and then recognised remains a mystery. 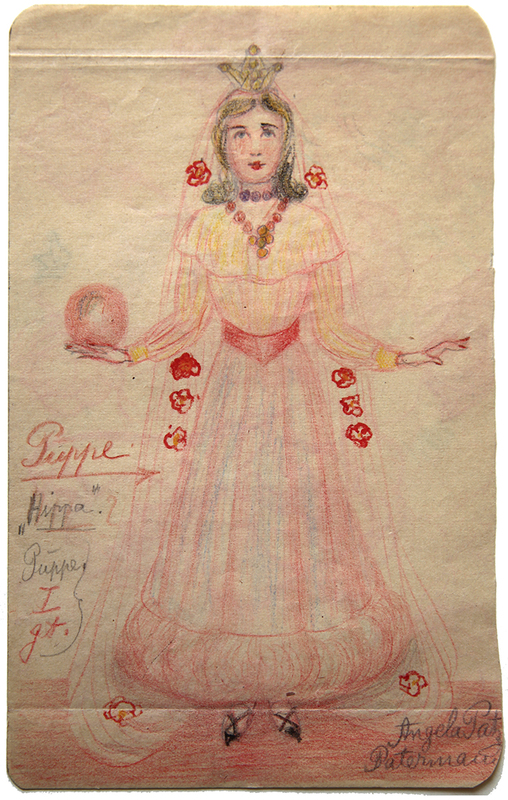 The drawings shown here date from 1940 – 1948, when the residents of the sanatorium were anxiously waiting to see if the Russians or The Allies would be the first to reach Berlin, troubling and apocalyptic times, but her work seems to be totally unaffected by these outside events and presumably acted as an escape from them. 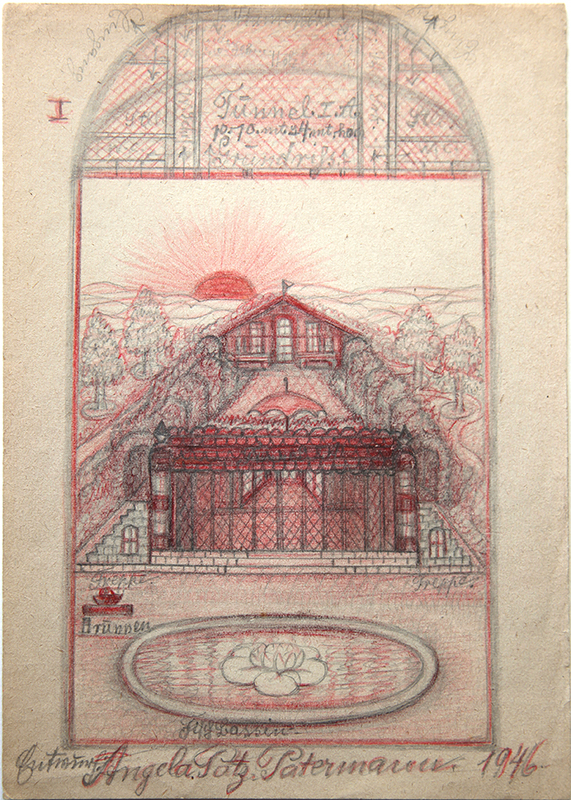 These drawings, all on found paper, contain a world of architectural fantasy – utopian pavilions for ladies and entire detailed designs for communal living - “In One Word – Room For Everybody”. 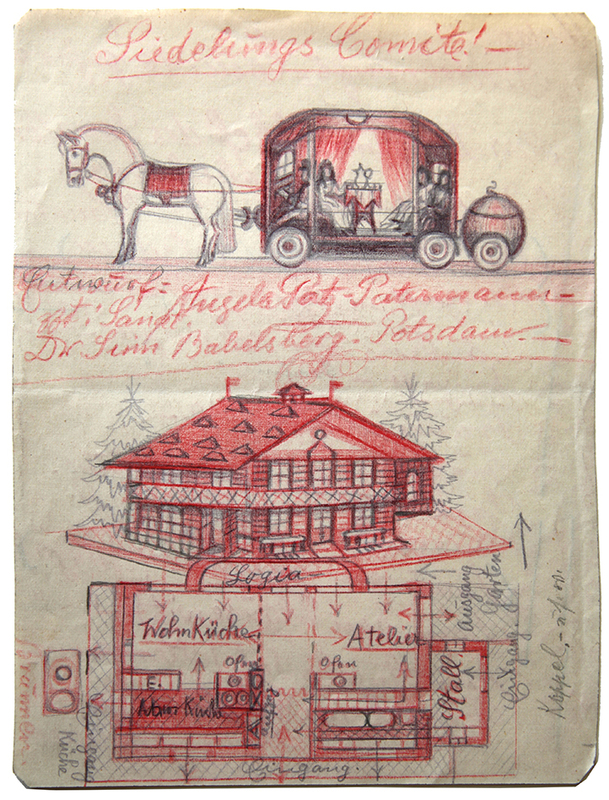 There are inventions years ahead of their time – she has a plan for a self-driving car that she calls “A Toy For Big And Small Children”, and a horse-drawn transport for 840 people which tows a smaller carriage filled with goulash to feed them! 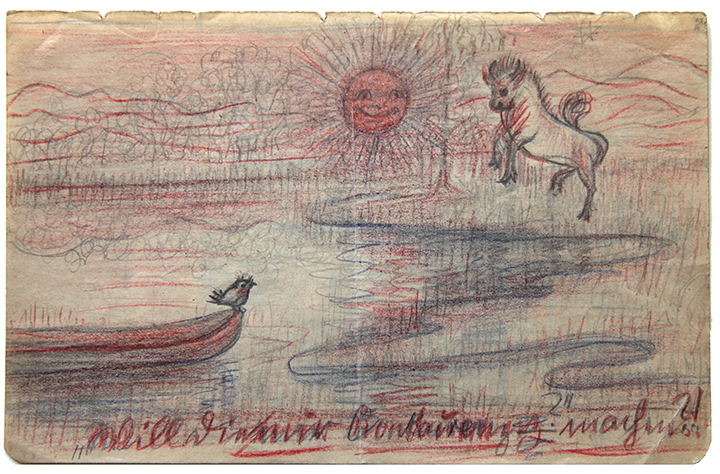 Some drawings have are a more spiritual and equally fantastical bent – poems about butterflies, suns smiling at horses and The Last Rose, a sad but haunting evocation of a life soon to change.